How to Defend Your Condo Rights/HOA Rights. How to fight back when your HOA Board turns your life upside down. Dr. Joyce Starr presents a self-defense guide for concerned or distraught condo and Homeowner Association (HOA) members. Targeted as a condo whistle-blower over toxic mold, the author confronted and won a complex legal enforcement case. This work offers critical strategies for defending and protecting your HOA rights. Discover how to stop HOA board abuse – including harassment, retaliation, and frivolous legal actions. 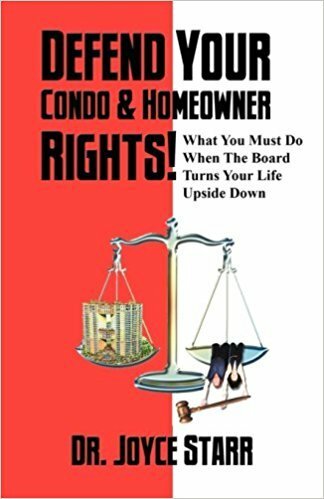 Dr. Starr’s book is your armor and shield when your condo/HOA board turns your life upside down. Defend Your Condo & Homeowner Rights was a Godsend to me. I was living in a man-made hell when I found this book. By initiating the suggestions and principles introduced in the book I found a way of accelerating my knowledge and ability to deal with a condo board and the usual cronies and sycophants through knowledge and intellect, as opposed to my first natural thought: to intimidate with threats. I live in a condo that has been dominated by the same group of people for over twenty years, they thought our building was their exclusive and personal club. Excellent, informative and instructional. In Defend Your Condo & Homeowner Rights, Dr. Joyce Starr describes the punitive and abusive nature of runaway condo and HOA boards (how they run away with your rights!) and precisely what to do about it. Her book provided an island of sanity and confirmation that I was not alone, nor was I imagining that I was surrounded by shark-infested condo waters.